Options - Customize your Macbook Pro to select: Condition, Hard Drive, Memory, Optional Windows OS and Battery. Extended Warranty and Insurance must be added at time of purchase. Product Includes - Macbook Pro Laptop shipped in heavy duty shipping boxes for maximum protection, battery, AC adapter and power cord, Apple macOS Sierra, optional Microsoft Windows OS and optional Parrallels installed, iSight and iLife installed on hard drive. Paper manuals not included. Electronic versions are available online. 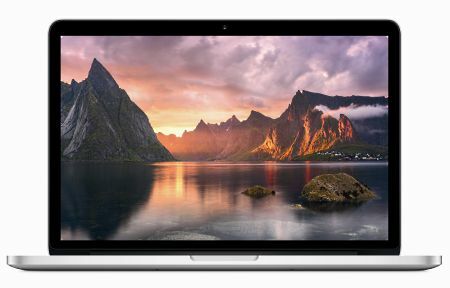 Save money at GainSaver on this popular refurbished 13.3-inch Retina Macbook Pro introduced in Late 2013. It has all the features you need for work and play. The Retina display gives you amazing detail for spreadsheets, photos and games. The high speed fourth generation processor powers through your most demanding applications. And with its Multi-Touch track pad and back-lit keyboard, its a pleasure to take with you on the road. The 13.3-inch discount Macbook Pro has a bright, high contrast Retina display with 2560 x 1600 resolution. That comes to over 4 million pixels. Your eye cannot make out the individual pixels because they are so small and tightly packed together on the screen. Reading text off the screen is almost like reading from a printed page. There are no jagged edges to the fonts. The Retina screen uses IPS technology to expand your view. You can look at the screen on your refurbished Macbook Pro from almost any angle without losing brightness and color quality. And youll appreciate that the glare reduction used by the Retina display does not reduce the color and brightness of the screen. The discount Late 2013 Macbook Pro is powered by the fourth generation Intel Dual Core i5 processor, running at 2.4GHz. Each core takes advantage of Hyper-Threading to handle multiple processing tasks at the same time. This cheap Macbook Pro is a portable digital photo studio you can take with you wherever you take your camera. The processor incorporates Intel Iris Graphics, a technology that almost doubles the performance of the Dual Core i5 processor. Whether you are playing games or running graphics-intensive applications, the refurbished Late 2013 Macbook Pro can handle it. The affordable 13.3-inch Macbook Pro has surprisingly high sound quality, considering its thin, small size. It has stereo speakers that output rich audio with high dynamic range and excellent clarity. The dual microphones reduce background sounds from behind the Macbook Pro, so your voice is loud and clear. The FaceTime HD camera in the refurbished Late 2013 Macbook Pro features an image sensor with increased low-light sensitivity. So when you are using FaceTime, the picture has less noise and improved colors in all lighting conditions. The FaceTime camera also includes a face detection feature that adjusts the picture quality to ensure you stand out from the background. The used Late 2013 Macbook Pro includes the Thunderbolt 2 port, which provides twice the data transfer speed of the original Thunderbolt connector. With Thunderbolt 2, you can copy data to and from your peripherals at up to 20Gbs. With two Thunderbolt ports that can daisy-chain up to six devices at once, you can connect 12 peripherals at once. You wont run out of ports with the refurbished Late 2013 Macbook Pro. There are also a number of other useful ports available, including two USB 3 ports and an HDMI port you can use to connect to your HD TV. Theres also an SDCX card slot to quickly transfer photos and files to your discount Macbook Pro. Only GainSaver gives you the ability to custom configure your refurbished Macbook Pro before you check out. You have the option of add more memory or a larger hard drive to hold all your videos and photos. GainSaver also offers an inexpensive 180 Extended Warranty to protect your Macbook Pro investment. Click the Buy Now button when you have gone through the Configurator options.